When asked in a late 2011 survey which president had done the best job in their lifetime, more respondents named Bill Clinton and Ronald Reagan than any other presidents. Sizeable numbers in each of the four generational groups, including majorities of Millennials and Gen Xers, cited Clinton as either their first or second choice as the best president. Reagan matched Clinton in mentions among Baby Boomers and members of the Silent generation. Despite the fact that many of them were quite young during Clinton’s years in office, nearly half (48%) of Millennials said Bill Clinton did the best job of any president in their lifetime. Another 12% cited him as second best. Fewer (37%) cited Obama as best or second-best. Relatively few (22%) said George W. Bush was a favorite. A majority of Xers also named Clinton as best (38%) or second-best (18%), while 43% cited Reagan (34% as best, 9% as second-best). Just 23% of Xers said Obama is the best or second best president of their lifetimes; 18% cited George H. W. Bush and 14% cited George W. Bush. Baby Boomers divided their loyalties about evenly between Clinton and Reagan, with 45% citing Reagan in either first (33%) or second (12%) place. About as many named Clinton as the best president (27%) or second-best (15%). About a quarter of Boomers (26%) cited John F. Kennedy. 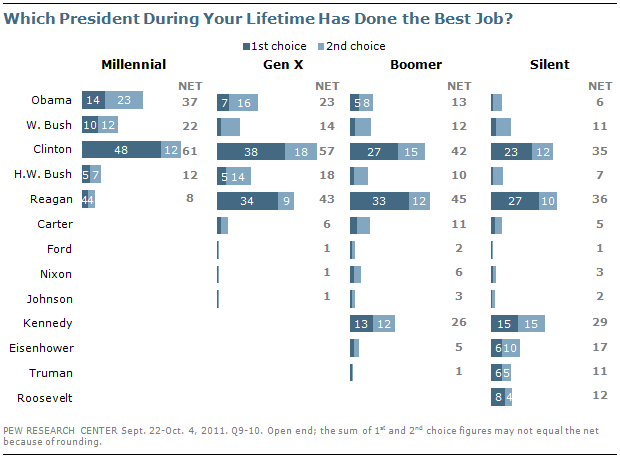 The Generations and Politics: Who Was Our Best President?